I'd like to do NASA's B-52. Would i be able to use the Revell kit? Also will i need to make any adaptions? That's the NB-52H, so if you mean 1/72, I'm afraid not. Revell's (Monogram's) kit is the B-52D, which has a taller tail, slimmer engines, and a very different tail turret arrangement, not to mention lacking all the lumps and bumps that the later B-52s accreted around the nose. The NB conversion adds more differences again, such as the special launch pylon inboard of the inner engines, and removing a lot of the armament features from the tail. A slightly better starting point is the AMT B-52H, currently available from Italeri, but it has problems over the engines being too small and the wing not drooping enough. Another option is the old NB-52B, of which there were two. That was superficially similar to the B-52D and I'm fairly sure there were conversions for the Monogram kit (although details elude me). The NB-52Bs started life in bare metal, not that very neat white scheme in your link, but they lasted an absolute age and may have acquired some paint later in their lives. A quick image search for "NB-52B" would quickly tell you. An added feature is that one of them - Balls 8, I think - had an enormous tally of missions down one side. 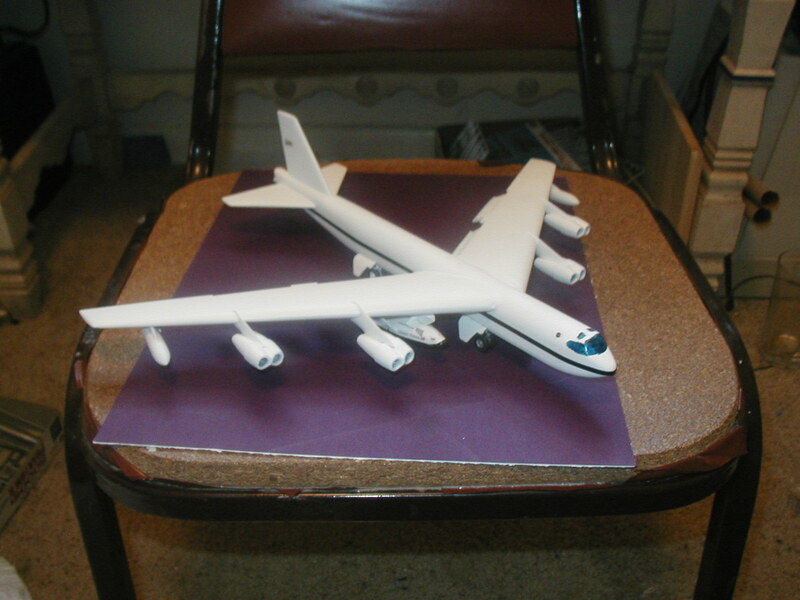 If, on the other hand, you prefer 1/144, Revell's B-52H is the starting point you want. I'm not sure about the availability of NB-52H parts. It will be in 1/144. So could I scratch build the part to attach To revells 1/144 version. Well, with enough good references, and enough plastic, you can do almost anything!The picture in your link shows that you can solve the biggest question, which is how to adapt the kit's weapons pylon to the NASA launch pylon. Solution: leave it off! The NB-52H is of course unarmed, but the B-52H had its tail gun removed a few years ago; so if the kit doesn't allow for that (it may not, it's a bit older than that), there will be plenty of references on the interweb for what covers the holes. I suspect the biggest problem will be markings. The old NB-52Bs had 1970s style markings for most of their working lives, when they weren't in USAF colours, while the NB-52H has reverted to the 1950s style. And you'd need tiny black numerals for the serial number on the tail. 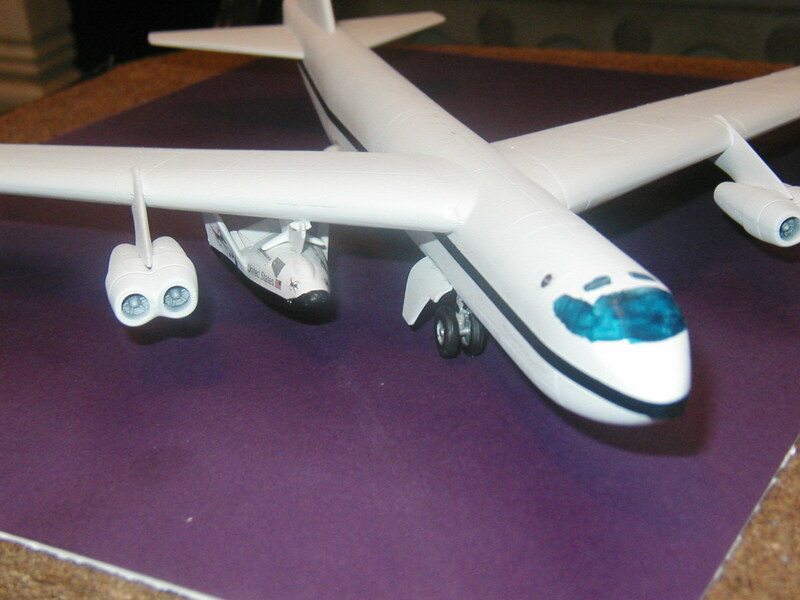 i will use this kt for my model of the NB-52H. So all i need to change on this kit is the pylon for the launch? i found these 2 revell kits that have been done. You can do it in 1/72nd scale by using the Monogram B-52D kit along with the Airwaves B-52H (Late) coversion kits in resin with the EVS fairings under the nose. I should check with Hannants to see if they have the conversion for the "H" BUFF and you will also need the smaller wing tanks. im not using the 1/72 kit, im using the 1/144 one. If working in 1/144 scale you would still find the Airwaves instructions helpful I'd think as they should tell you what you need to modify and where. I'm sure somebody would be able to scan them for you. With this converting lark there's all sorts of devious ways to get your knowledge and I've often found good stuff in articles about the subject in other scales. I'd also look up reviews of the base kit you're using as it's not unknown for a kit of a particular mark of aircraft to have features from other marks, in that case you may find an inaccuracy in the kit helps you along. Ditto looking for unused parts on the sprues.